Derrick Rose is dealing with a sore neck but the Bulls point guard doesn’t expect it to sideline him for Thursday’s home opener against the New York Knicks. Rose is under the assumption he tweaked his neck at some point during Chicago’s regular season opener in Miami on Tuesday, though he doesn’t know exactly when it happened. 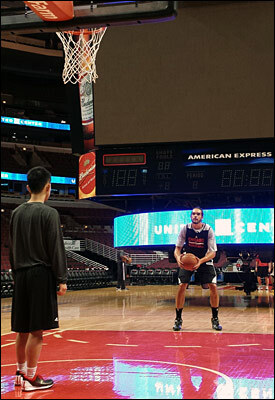 Rose missed Wednesday’s practice to rest and receive treatment, then sat out of Thursday’s morning shootaround. “We’re coming into these games where teams are really shooting for us,” noted Rose. “We have to be the most aggressive team out there. That’s what we didn’t do last game. Improvement from Tuesday in Rose’s mind will also involve better ball movement and hitting shots, especially those they normally make. Thibodeau, meanwhile, is looking for a more consistent effort than what he saw against the Heat. Staying out of foul trouble—both Jimmy Butler and Luol Deng were hampered by that in the first half of the opener—will also help. “You’ve got to play for 48 minutes,” said Thibodeau. The first quarter was very good; the second quarter we gave up 37 points. When [Rose] went to the bench and Jimmy went to the bench and Lu went to the bench, we had a hard time. You have a bad quarter against a quality team and it’s hard to make up.